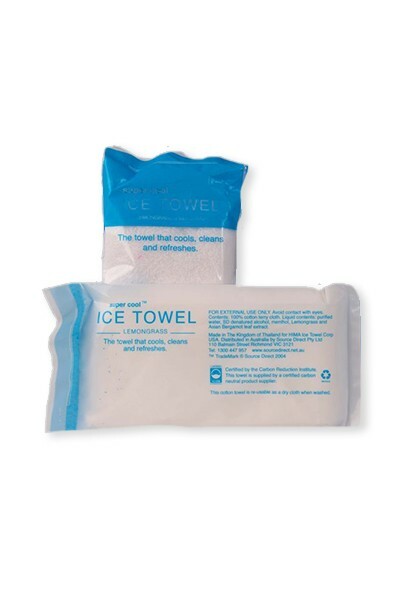 Ice Towels are fantastic for rejuvenation any time but especially in the heat! Keep them handy and use them when you feel hot or need to freshen up. Great during or after sport and physical activity. Ideal at the beach or on picnics. Great anytime! If you require more information, simply click on the contact us link and complete the information form so that we can respond appropriately. Moist, white terry towel cloths infused with aromatherapy extracts. They smell devine (lemongrass and bergamot is our favourite) and although they can be used any time, they are best used straight out of the fridge or eskie! Cool and refreshing. Each towel is approx 300mm x 300mm (face cloth size) and can be washed after use and reused as a face cloth or cleaning cloth.